Shareist is a tool I learned about while attending the latest Shareasale conference. Honestly it was the best part of the event and well worth the cost of my plane ticket. Shareist is a content sharing platform that allows you to import, schedule, and track all of you updates to various accounts. I currently use it for both LillePunkin.com, The Knerl Family Media Social Media accounts, 1099Mom.com and 2 social media clients. It pushes content to Twitter, LinkedIn, G+, and Facebook, tracks everything (including clicks through to your website), and has amazing customization abilities. I don't know why everyone isn't buzzing about this social tool, but I'm hoping that once you know about it, you can use it to simplify your social media tasks to gain back some of your day and make your shares more effective. 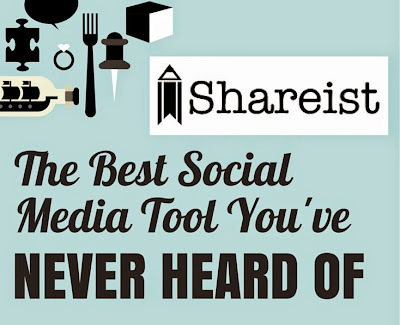 How Can you Share Blog Posts and Articles with Shareist? Quick share - which blasts all the selected posts into your queue to be shared on the platforms and at the times you select. You cannot customize titles, descriptions, or photos after this has been done, as well as you are unable to "tag" on Twitter with this method. (But it is the easiest way to bulk share). Advanced share - this lets you share one platform at a time (G+, LinkedIn, Twitter, Facebook) with highly customized results. You can choose to share Facebook posts as an article or a photo update. You can choose to share your Twitter update with or without a photo, and tag others in it. You can also schedule to G+ through your Buffer account this way. You can choose to share now, during the next available scheduled time slot, or at a later date (or dates) you specify. There are benefits to both. For just sharing my own stuff, I prefer Quickshare, because I can customize everything from the browser extension BEFORE it hits my inbox, and I don't need to tag anyone when it's my own article. When wanting to catch someone's attention by tagging them on Twitter, or I want to share a Facebook update as a photo, I'll use the Advanced Share method. There is also a $50 and $200 a month level for more accounts -- like an agency would use. Bottom line: Shareist is not something you can set up in 5 minutes and begin realizing the full potential right away. You should take a few hours to get everything set up (customer service can even help you with this), and tweak as you go to make sure it is exactly as you like it. From there, it's a great tool to work into your daily processes that encompasses just about everything you need to produce, schedule, share and measure content from Twitter, G+, LinkedIn, Facebook, and your blog. I have tried other services since (including Meet Edgar) and nothing has compared to the functionality of Shariest. Start with Shareist now, and see how you can finally be in control of your web sharing. You can use it exactly the way you want, or see our easy course on how to do it our way! *Affiliate links are used. But we loved Shareist before we became an affiliate.